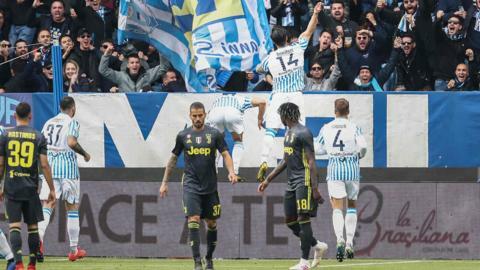 Juventus miss the chance to wrap up a record eighth consecutive Serie A title as they lose 2-1 at SPAL. Cristiano Ronaldo scores his 10th Juventus goal as they beat SPAL to remain unbeaten at the top of Serie A.
Roma warm up for their Champions League semi-final first leg with Liverpool with victory at Serie A strugglers SPAL. Serie A leaders Juventus are held to a surprise goalless draw at SPAL, but extend their lead at the top of the table to five points.